Long before children speak they are collecting words. 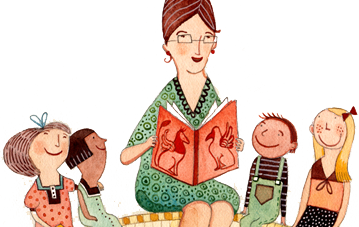 Reading stories, singing lullabies and reciting nursery rhymes to babies help build a rich foundation for language for the coming years. The illustrations in books help babies to recognize simple objects in their world. And the intimacy and warmth of shared reading is a joy for both baby and parent. Books with repetition of sounds and words. Books that say a lot with simple language. Books that illustrate the primary things in your child’s life. Books that are just the right size for small hands. Books of nursery rhymes, lullabies and songs. Books that are sturdy and will stand up to being chewed, pounded or covered in mushed banana. Books with simple, uncluttered illustrations of familiar shapes. Books that have physical “tricks” such as finger holes, opening doors and peek holes to encourage interaction and involvement. Wordless books that stimulate babies and toddlers visually and mentally and encourage them to create their own stories. Books in various formats such as board books, cloth books, small chunky books and plastic “bath” books. Visit your local public library regularly. Your child will soon learn that books are an important and fun part of life. Encourage family members and friends to buy books as presents for your baby or toddler and for all your children. Share books with your baby or toddler at a time when they are most alert and full of curiosity. And let them explore books in their own way — grabbing, patting, poking and literally eating them up! Have books visible in different places around the house, not just confined to bookshelves.